I remember walking through the front door and seeing several contraptions on their dinning room table. There were four small cooking stoves located in the center of the table. They looked similar to the portable Coleman propane stoves you take car camping Yet, smaller and designed with the sole intention to boil liquids. Danny and his wife also mentioned that they usually would include salmon and fish balls into their hot pot menu, but figured that most people would be turned off by the fishy smell they emit. Not a bad spread at all if you ask me. I was thoroughly impressed. So the concept of hot pot is fairly simple. You have a pot of broth that sits on a portable burner. The broth is brought to a boil and then turned down to a simmer. You then place the various food items in the broth and once it’s cooked you scoop them out and feast. There are rules to hot pot. The first, and most important rule is that you only hot pot with people that you like. You are sharing the same pot with people around you. The food is being placed into the same broth that you and others are eating from. It’s probably a good idea to enjoy the company of the person sitting to either side of you. The other rule is to have fun and converse as you eat. 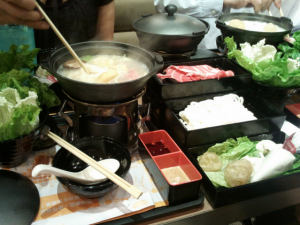 Hot pot is intended to be a very social event and it is not uncommon for the meal to last hours. This made me realize how often I eat my meals quickly. I have developed the habit of eating fast and not taking the time to stop until I’ve finished my meal or until I’m full. It’s hard to converse and enjoy the company of others when everyone is stuffing their faces with food. 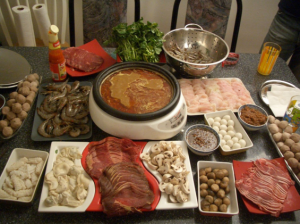 Now, there are some basic materials needed to successfully host a hot pot party. First, you need a burner. There are two kind; electric or butane burners. These can be found at most asian grocery stores and are very compact. Next, you will need a pot to boil the broth in. There are even specially designed pots with a divider in the middle to allow for two different kinds of broth in the same pot. 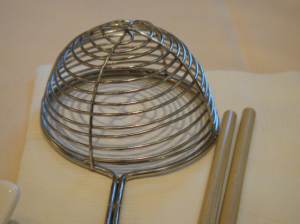 Next, you will need some small strainer spoons,(I’ve included a picture below). I was amazed at how well these tools worked to grab food out of the broth. Lastly, you will need chopsticks or a fork to eat all the yumminess. 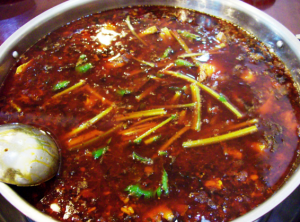 If you’ve been ready and wondering if hot pot is spicy, the answer is that it can be. There are many different types of broth and spices that can be added to affect the flavor and level of hotness. There are even special dipping sauces. My favorite was a barbecue-fish dipping sauce. I hope this article got your mouth salivating. If you have some Chinese friends I would suggest convincing them to throw you a hot pot party. If you don’t then pick up some of the items and ingredients listed above and get your hot pot party on!